The Federal Reserve has suggested that the worst of the US recession is over. It said that while "economic activity is likely to remain weak for a time", it had begun to "level off". The central bank's comments came as it decided to keep US interest rates on hold at between 0% and 0.25%, as widely expected by commentators. The central bank added that the current low levels of interest rates will likely continue "for an extended period" to aid the continuing recovery. 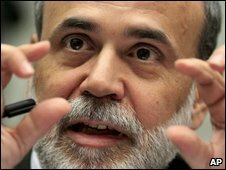 Its comments came amid growing signs of an upturn in the US economy. While US unemployment rose again last month, the 247,000 job cuts were far fewer than analysts had expected. Other recent official figures showed that US consumer spending had risen in June for a second successive month, while worker productivity had increased at its fastest annual pace for nearly six years in the second quarter of 2009. In addition, figures on Wednesday showed that US exports had risen by 2% to $125.8bn (£76bn) in June, a sign that the manufacturing sector was improving. Analysts broadly welcomed the Fed's comments. "It is not all that surprising, it acknowledges a lot of what we have been seeing, that conditions are stabilising and the recession may be ending," said Mark Vitner, an economist at Wells Fargo. The Fed and the US government have carried out a number of measures to help stimulate the US economy since the end of last year. The main two have been President Obama's $787bn economic stimulus package, which was signed into law in February, and October's $700bn Troubled Assets Relief Program for the banking sector. In March, the Fed also announced a $1.2 trillion programme of buying government debt to boost lending and promote economic recovery - a policy known as quantitative easing. US interest rates were cut to the current level of between 0% and 0.25% in December last year, where they have remained ever since. Before then rates had fallen steadily from a high of 5.25% in September 2007.